← BOKEH ALL GROWN UP! Peaches asleep - the only time when she keeps still! After losing my darling Wispa, my house seemed very empty, and it seemed that the only cure would be to fill this void with a new Devon Rex kitten. 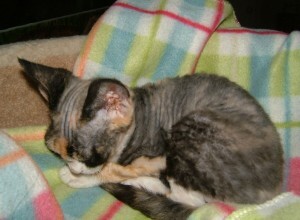 So I am pleased to introduce little Peaches, a little tortie and white kitten. She has been well-reared, so she is very bold, and is used to household noises and goings-on. Irrepressible and full of fun, amazing antics and endearing habits; she is already an expert at retrieving, stealing from your plate, and weaving her way into our hearts. We lost our Siamese, Oliver, after a few years of health problems, at the old age of 17 1/2. 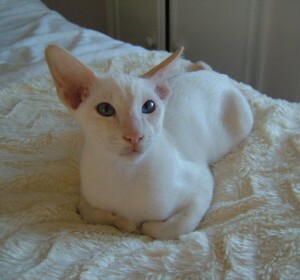 After having Siamese in our lives for nearly 40 years – we had to get another. So along came Leo, an irrepressible cream tabbypoint kitten who thinks that everything belongs to him, should be carried around the house, or be re-arranged to his liking. He and Peaches are now best friends, and they patrol the house together like a little pack, looking for new mischief to get into! This entry was posted in Suzanne's FAQ's. Bookmark the permalink.